I came to Standing Rock in answer to this call. I wanted to lend my energy to the beautiful movement that is being borne out of the glaring act of violence which is the Dakota Access Pipeline. I wanted to learn from those who were standing up to the environmental status quo. I wanted to spend my Thanksgiving in honor of native people rather than over a full plate of willful avoidance back home. The trip was less than a week, with two full days’ driving time, and yet it was a transformative experience. I have the tendency to romanticize and I don’t want to create the idea that it was some sort of fairy tale but in so many ways the place and the movement that is Standing Rock is entirely beautiful. The people, the attitude of work and service, the prayers, the songs, the hope, the solidarity, the reverence to the natural elements- it was all beautiful. I and many others came by choice but, at its heart, this movement is an obligatory act of self-preservation for the Dakota/Lacota/Natoka people. The camp and the movement that drives it is borne out of the very real threat that is the Dakota Access Pipeline. 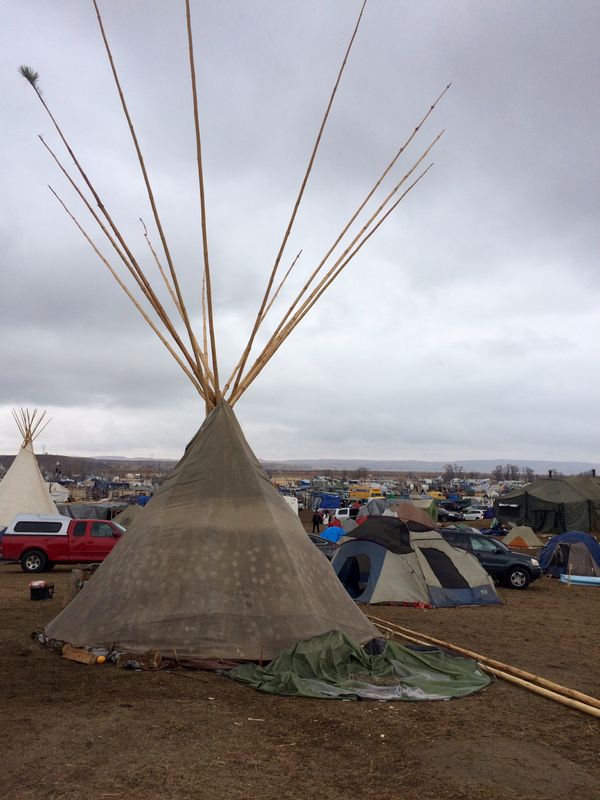 What follows are my observations from my short time at Oceti Sakowin camp. Oceti Sakowin camp splayed out in a valley along a winding river and onto a few rolling hills filled with tepees and tents and cars and flags and people. It was geographically disorienting but there were prominent visual markers including a white dome, the Sacred Fire, flag road, and the road, blocked off, which marked pipeline territory. It was also socially disorienting; it was hard to be sure what my role would be and where I would fit into this place. The daily structure was kicked off with a morning prayer at 6:30 or 7:00 that started at the Sacred Fire and ended with a water ceremony at the muddy banks of a tributary of the Missouri River. From there on there was work and meetings and meals. The work was the daily running and building of camp- chopping wood, sorting donations, erecting structures, digging structures, and chopping firewood. The meetings included orientation, nonviolent resistance training, media training, legal training and decolonization worksops. Most events began and ended with a prayer led by an elder. All my meals were shared in the kitchen of the Michigan camp along Flag Road and others ate at their own small lodgings or at the main kitchen. My group connected with a Michigan camp in advance and we met with them upon arrival. There were indigenous and non-native Michiganders arriving and departing every day, bringing donations, sharing meals, discovering common friends and sleeping side-by-side in dark but warm bivouac tents. There was a loudspeaker that I couldn’t hear very well from the Michigan camp so a lot of what I learned was through word of mouth or signs. There were signs everywhere! Some were declarations of support and solidarity from other groups, artwork and strong short declarations like “No DAPL”, “Stop the Black Snake”, “Water is Life”. Others were instructions: “Non Violent Action Principals”, “No Parking Here at Any Time”, “All Campers Must attend orientation- Daily at 9am at the white dome”. The Michigan camp and hundreds of others were part of the larger settlement known as Oceti Sakowin camp. It is one of many that have grown in response to the pipeline opposition. Along with Red Warrior Camp, it lies off of the official reservation on contested land. Those at the camp call this “treaty land” referring to the treaty of 1868, which granted the Black Hills to the “Sioux,” but which was stolen shortly thereafter in an illegal breach of the treaty. A few months ago, these hills were pristine and untouched as the sacred hills that surround them, and now a bustling settlement is underway. 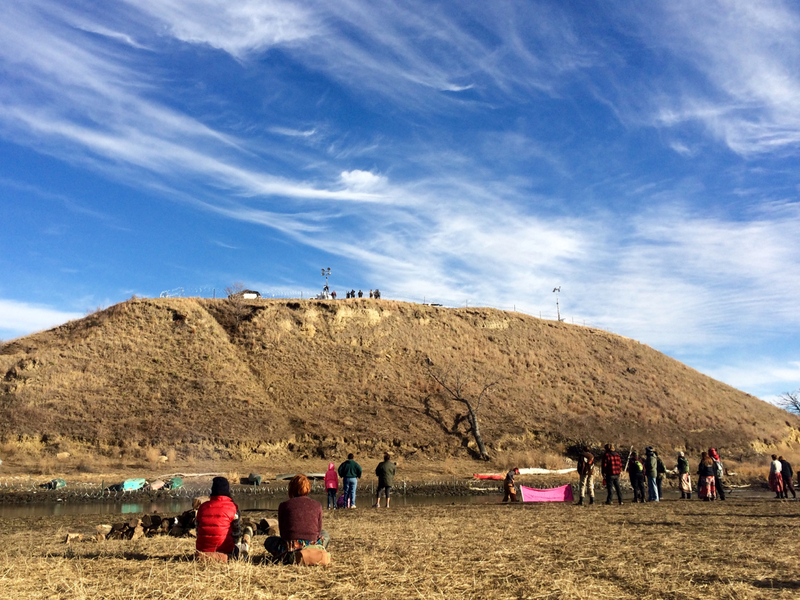 Oceti Sakowin camp is not merely another protest or spontaneous gathering, it is a massive sacred occurrence: its presence, all actions that take place within it, and all people who visit are a part of the sacred ritual. Peacefulness was taken seriously. There were no weapons, no weapon substitutes, no drugs nor alcohol, no swearing, and no violent language. Not even gossip was welcome. Overall, the energy was peaceful but purposeful, loving but strong. All of this spreads, and it takes awhile to sink in. It is only part of why I wish I could’ve stayed longer. The culture of the camp was dominantly Dakota/Lakota/Nakota but its very newness made it subject to improvisation. It was a mix of indigenous cultures, “mainstream” Americans of every race, and foreigners. To be a white person there and a newcomer was to be a demographic majority but a cultural minority. It was important for the integrity of the camp that all actions and decisions be indigenous-centered and indigenous-led. I tried to make my whiteness as unobtrusive as possible although my very presence surely had an impact. The learning curve was steep. I cringe to consider what offenses I may have committed due to my lack of knowledge of proper protocol. Did I look around to see if an elder was waiting to eat before I did? Did I speak out of turn? Did I take more than I gave? Was I willing to do the unglamorous drudge work? It required constant vigilance. One group of visitors burst out singing “Hey Jude” oblivious to the fact that it was too late to be so loud and that, more to the point, this was one singular space in a million where mainstream white American culture was not appropriate. There was a fine line between respect and appropriation- wear a skirt but not a feather, join the calls “mni wiconi!” (“water is life!”) but not the trills and whoops of celebration, attend the prayer but don’t enter the center ring of the fire, ask questions but don’t assume you deserve an explanation, take advantage of the learning opportunities but don’t take more than you give, come but don’t assume you can go everywhere, come but don’t assume this is your fight, fight but don’t assume you have the solutions. The unspoken truth for visitors to the camp was that, even though you are there in service and you deserve nothing, you will still be given an abundance of love and wisdom and support. On my last morning at camp, I stood in a ring of hundreds of people around the Sacred Fire. Some women were preparing for the water ceremony and the leader pointed to me and asked me to carry a bag with some of her utensils as they led the procession to the river. My mouth dropped open. I was stupefied with honor to be included in the ceremony. As we walked, the woman instructed other women to take turns holding the copper urns and led us in a song of respect for water. She taught us the words and encouraged us to join in. It was more than I could’ve hoped for. I approached her afterward and told her how much this meant to me and she said that a woman is not a woman until she carries the water. I was not there to learn, I was there to serve, but I wanted to learn and I was fortunate enough to have a direct and indirect education from trainings to observation of others. I attended a “decolonization” discussion which I count as one of the best classes of my life. It was academic and immediately relevant. For three hours we looked directly at the uncomfortable issues of our history and our current surroundings through the lens of awareness and progress. I wanted to raise my hand and tell her that the agony of detailing the obvious (day after day) to well-intentioned but often oblivious white people was not in vain. I have the sincere hope and belief that each of us left that experience with a greater humanity, which we will bring back to our families and friends. The more white people getting an education at camp, the more white people will get an education away from it! 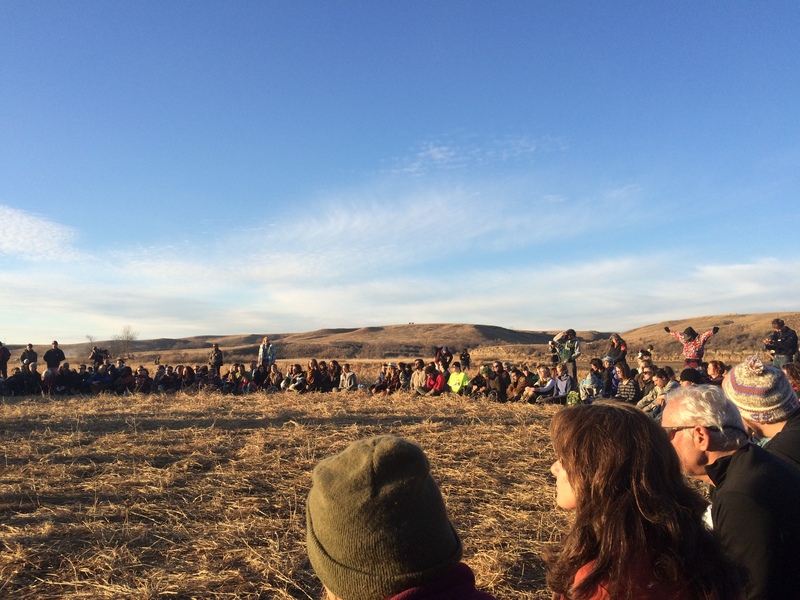 Then there was the stuff of it- the real reason we all were there, that we had come to show our support, that we had been called to stand with standing rock, and that was the pipeline. Glaring lights penetrated the night with their powerful beams like a barren ski slope. There was razor wire that was put up over the course of my time just across a narrow part of the river which marked the boundary between the occupied treaty land and the furthest reach of the pipeline as it currently stands. The focal point of this action is a hill called Turtle Island. It is a burial ground where long-dead chieftains and recent decedents risk immediate disinterment. It is sacred to the Dakota, Lakota, and Nakota tribes. There were “actions” on at least a daily basis, during which water protectors (not protesters) would gather to pray or hold ceremony or stand to create a front line to try to stop the progress of the pipeline. At one prayer circle, a young man spoke with arresting vulnerability about why he was fighting to stop the black snake. He said he wants to have children and for his son to one day be able to fish from that river. He wants his son to catch a fish and say “look Dad!” and be proud and eat that fish and have it make him strong. He cried as he said this. So did I. “Direct action training” was another powerful experience. We were admonished to be peaceful in all ways, we were schooled in chemical weapons and what to expect in jail. We formed a mock action by circling around water protectors and banner holders and lacing arms back to back. I was eager to attend a direct action but, by the time I got the training, it was time to leave. I was willing to go though, I signed the legal paperwork detailing my preferences in the event of an arrest. I’m grateful for the humbling and grounding experience of imagining myself to be arrested, to consider how far I was willing to go, to personalize just a fraction of the dedication of the thousands of people around me. I regret that I was not arrested if that would advance the cause. I regret not joining an action while I was there. I was told, though, that prayer is an action. By joining the water ceremonies, by praying before I ate, by opening my heart and offering my own words and energy, by sending love and respect and gratitude- that is an action too. I love this idea and it has motivated me to write this down- to retain the prayer in my heart and to share it with others. I understand that each prayer is individual, so, while I can never speak for this cause or for those who are so mightily fighting for it, I hope that my words and prayers can supporting it too. Why were we all there? Probably, because we were asked. For anyone who decries the genocide, the culturcide the erasure of native peoples in our nation’s history, here is an opportunity to stand up to the insidious shadows of imperialism that continue to this day. How, when reparations are due, can we continue to add to our moral debt in this way? It’s impossible to just let it happen, so we are trying to lend support. As I see it, this movement is about many things. It is about water and the importance of keeping that life source pure. It is about abuse of a common resource for the benefit of a few. It is about representation and the disparity that leaves native people voiceless in decisions that affect their well-being. It is about land and the historical encroachments that continue to the present. It is about environmental racism and the continuation of practices where the worst environmental hazards are co-located with the poorest and least represented people. It is about energy infrastructure and the need to disinvest in dirty extractive sources to reduce energy consumption and increase renewable and sustainable sourcing. It is about a holistic approach to the environment, as embodied by ancient indigenous cultures that respect and limit what they use. It is about current indigenous realities that recognize that recognize their remaining land as finite, non-transferrable and non-expendable. It is about the militarization of business interests, which show extensive police and National Guard support for an illegal private investment over individual human rights. It is about stepping up for what we believe in when it becomes clear that the threat is real and that our government leaders are not going to save or solve us. It is about taking one small step toward ending the paradigm of colonizer/victim by creating solidarity and unity for a clear and obvious good. It is about learning another way to do things. It is about being better people. In this writing, I have attempted to share my own experience and understanding with care for the sensitivity of the subject and my very amateur relationship to it. I request corrections for any errors as well as forgiveness for any unintentional offenses. This entry was posted in Non-Fiction, Personal Narrative, Politics/Social Concerns and tagged nodapl, standingrock. Bookmark the permalink. A valuable lesson. That you can’t win this way-that’s the lesson!